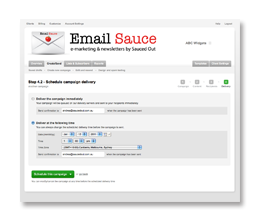 Creating a professional email campaign is quick and easy using Email Sauce. Testing and measuring your email campaign is easy, just use our A/B testing feature that allows you to use two different subject links and see which email is opened the most. 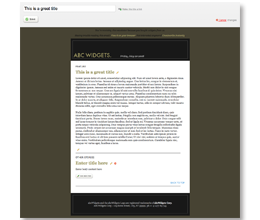 Our online editor lets you preview your email as you build it. You can add your own text and images and move them around as you go. You can also save a draft version so you can leave and return to finish it at any time. 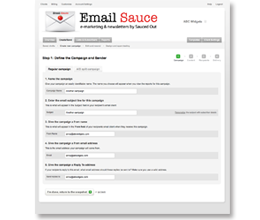 When you sign up for Email Sauce you get a FREE email template. If you want to use your own or have us design on for you it will be made available in your template area within Email Sauce. Add new designs to your gallery and you will be able to use a different design template for each email campaign you send! You have total control over what you send. Change the details at any time for the name or email address that you want to send from. Type in your own subject and choose your own reply-to email addresses. Build your email today and send it tomorrow! 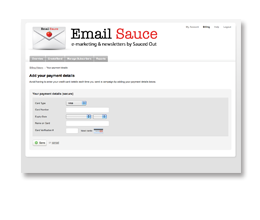 Our flexible system allows you to schedule when you want to send your emails. You have the choice of sending it immediately or scheduling it for delivery at another time - whether it's in 5 minutes, 5 days or in a month's time. You can also send yourself a free preview email at any time. Our pricing model means that you will never pay any setup, monthly or hidden fees and you only pay when you're actually sending a campaign (design services not included). Make it personal by inserting your subscribers name. Simple pricing that means you only pay when you send, no hidden fees. Full control over when your recipients will receive your campaigns -send it today, tomorrow or next week! Add a line of code to your site for a full archive that automatically updates - or ask us to do it for you. Automatically track your campaign related sales and conversions in GA. Don't have it set up on your site? Ask us to do it for you. Build and send your own campaigns with ease.